The following rather nice paragraph, a concise explanation of our dialect's origins, with some specific word examples, is on Wikipedia and is quoted verbatim. "The dialect of Newcastle is known as Geordie, and contains a large amount of vocabulary and distinctive word pronunciations not used in other parts of the United Kingdom. The Geordie dialect has much of its origins in the language spoken by the Anglo-Saxon populations who migrated to and conquered much of England after the end of Roman Imperial rule. This language was the forerunner of Modern English, but while the dialects of other English regions have been heavily altered by the influences of other foreign languages, particularly Latin and Norman French, the Geordie dialect retains many elements of the old language. An example of this is the pronunciation of certain words: dead, cow, house and strong are pronounced 'deed', 'coo", 'hoos' and 'strang' — which is how they were pronounced in the Anglo-Saxon language. Other Geordie words with Anglo-Saxon origins include: 'larn' (from the Anglo-Saxon 'laeran', meaning teach), 'burn' (stream) and 'gan' (go). 'Bairn' and 'hyem', meaning child and home, are examples of Geordie words with origins in Scandinavia; 'barn' and 'hjem' are the corresponding modern Norwegian words. Some words used in the Geordie dialect are used elsewhere in the northern United Kingdom. The words 'bonny' (meaning pretty), 'howay' (come on), 'stot' (bounce) and 'hadaway' (go away or you're kidding), all appear to be used in Scottish dialect; 'aye' (yes) and 'nowt' (nothing) are used elsewhere in northern England. Many words, however, appear to be used exclusively in Newcastle and the surrounding area, such as 'Canny' (a versatile word meaning good, nice or very), 'bait' (food), 'hacky' (dirty), 'netty' (toilet), 'hoy' (throw)." Since more or less the beginnings of The Royal Society in the mid seventeenth century, and with its advocacy of plain, natural speaking, various historians and academics (both professional and amateur) have taken a keen interest in our local Northumbrian language. Some significant works are John T Brockett's 'Glossary on North Country words' 1846, R Oliver Heslop's 'Northumberland words' 1892-94, F M T Palgrave's 'List of words/phrases in everyday use in Hetton Le Hole' 1896. There are many other relevant studies and documents, often the hard work of members of local history societies, keen to research and document our precious legacy. A native of Morpeth, Roland was a scholar, historian, writer and tireless campaigner on behalf of all things Northumbrian. This very modest man, gentle and quiet but doggedly determined, set up the Morpeth Antiquarian Society in 1946 and in time this led to the creation of the Chantry Museum, The Morpeth Gathering, the Language Society etc. For insight into his work and a touching obituary do visit the website of Northumbriana.org.uk (see Links). This organisation's work is all about continuing Northumberland's traditions - promoting the music, language, dance, crafts, literature, history and traditional culture of Northumberland. Bill, pictured on the right, was also a modest but nevertheless remarkable man. This tireless campaigner for appreciation of our regional dialect, passed away in 2007. "He exemplified the task of poetry without ever wishing to be treat as a poet. Private and uncompetitive, he was at least these things: poet, archivist, scholar, translator, prison-rights campaigner, pianist, historian, curator, performer, editor, short-story writer, essayist, teacher, book-maker and folk loricist"
Bill worked tirelessly to collate/research our local dialect words and phrases and his books (particularly his Dictionary of North East Dialect) are his great legacy. Bill was not a local man, he was born in Middlesex and moved to the North East in 1990. He adopted the area and loved the region and it's people, particularly the mining community, with it's sub-dialect, pitmatic. I suppose it was typical of the man that he should settle in Seaham, a town with a rich mining heritage. Bill tragically died suddenly of a heart attack. He was only fifty nine. The region has lost one of it's great crusaders and he is greatly missed by all those who knew him and respected him so much. 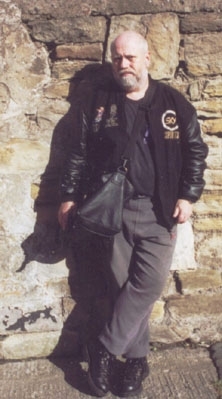 Visit Bill's 'Durham and Tyneside Dialect Group' website - go to links page for access. The English language has many regional variations or dialects. 1) words unique to the area. 2) nationally used words used locally in a unique way. 3) the way the words are spoken (the accent). The dialects of Northumberland, Durham and Tyneside are unique. The following is a brief history of how it seems to have evolved. The English language has it’s origins in Anglo Saxon (Old English or OE) and still many OE words (or, to be more accurate, close derivatives of them) remain in national use including one well worn swear word/obscenity in particular! Germanic tribes (Angles, Saxons, Jutes) invaded England after the fall of the Roman Empire and gained overall control from the 5th century AD and apart from the loss of control resulting from the Viking Invasion in the north of England, this remained so until the Norman Invasion in 1066. Whilst the Anglo Saxons retained control there was relative consistency of language throughout England with variations in the south (West Saxon OE) and the north (Anglian, comprising of Mercian and Northumbrian). Even that minimised as late West Saxon became the written norm nationally, in the late 10th century. It seems to have been the Viking invasion of the 9th century and then the Norman invasion of the 11th century which had a destabilising effect on this relatively uniform situation. The Vikings brought many of their own words (Old Norse - ON) into the north (some spread into southern speech too) and then, perhaps more critically, the Normans introduced Norman French (as well as the pre-existing Latin) as the language of government, the judiciary, literature etc. So the business of the ruling class was conducted in a different language to that of the ordinary people. One can see that this could lead to a gradual breakdown in consistency of language, as it evolved, from local area to area. So throughout the middle ages (11th to 13th centuries) divergence of language occurred particularly between north and south. Major changes in the grammar of the language developed too. This was the period of middle English (ME). The Angevin Empire broke up in the early 13th century. Anglo-Normans had to commit either to England or to France. This reversal opened the way for a potential revival of a consistent form of English language and also, following the War of the Roses, national unity became a more pressing political matter. In that situation one may have expected dialects to erode as speech became standardised nationally again (with central government control, the invention of the printing press, the growth of grammar schools and teaching norms etc.) but surprisingly, not so. By the 17th/18th centuries dialects were being closely linked to regional identity with works written in dialect appearing and even interest in dialect by academics (eg. The Royal Society). Ordinary working folk were becoming more literate, more politically aware and would have a strong sense of belonging, dialect being seen as an integral part of that feeling. Hence the rising status of dialect with this ‘legitimacy’ and perhaps as a resistance to central governmental controls and attempted influence. 1) The development of mining and the eventual industrial revolution. There was an influx of rural/farming families (and their language) into the growing urban areas. In the mines a unique sub-dialect (pitmatic) developed. 2) Immigration of Irish and Scottish families looking for work in the heavy industries. 3) The keel men had strong Scottish (Edinburgh area) connections. 4) During the 17th to 19th centuries there were close maritime ties with Holland which introduced some Dutch words into our local dialect (eg. hoy-throw). Whilst the influence of the Viking invasion may not have quite been so influential in Northumberland and Durham (unlike Yorkshire and Cumbria) nevertheless it still was an important factor. The relative geographic isolation of the north east (before the development of transport systems) perhaps created a situation where there was strong retention of OE combined with ON influences. The Norman (Anglo French) influence was to a much lesser degree and hence during the ME period our dialect developed in it’s own distinct way. The growth of the Great Northern Coalfield and influx of rural, then Scottish and Irish workers bringing their language and dialect added to the grand mix. It is from all these influences that Northumbria today has it’s own unique local dialect. Present day rapid forms of communication, the computer age, the media, globalisation etc. may erode dialect (and certainly many unique local words are disappearing) but despite this our dialect remains the primary and central identifier of the area we live in. Acknowledgement - to the late Bill Griffiths of the Durham & Tyneside Dialect Research Group/Centre for Northern Studies - see links. For definitive works on our dialect check out his Dictionary of North East Dialect and other publications. The information I have given above owes much to his research. Below is the transcript of one of the late Bill Griffiths' lecture notes. I was honoured to be there - he had asked me to do some readings, in my Blaydon dialect. I'm sure he wouldn't mind this fascinating information being available. His work on our local dialect is his great legacy. How fortunate we were to have him up here in the north east. Read on! We might as well start, as it were, at the beginning, with NORTHUMBRIA. Unlike Brittania and Hibernia – abstractions in use since Roman times – the pseudo-Latin term Northumbria was not used by the Anglo-Saxons. They thought of territory in terms of peoples, and used not Northumbria but Northanhymbre or Northhymbre – meaning something like “the people who lived in an undefined tract from the north down to the Humber.” It suggests that the Humber gained significance as the boundary with the people of Lindsey – modern Lincolnshire - south of the Humber, at a defining point in North East development, and proved a useful descriptor in following centuries. However, the Humber should not be taken as a major ethnic or linguistic boundary in AS times, or arguably, since. The OED does not list proper nouns, but under the adjective ‘northumbrian’ their first reference is to Drayton’s poem Polyolbion [14/937] of 1622. It may be significant that he was writing a survey of the rivers of England, and in what could justly be called an antiquarian style. However useful the concept of ‘Northumbria’ has proved since, we should remember that it did not have fixed, stable boundaries in the AS period (except arguably at its southern limit). The borders of ancient Northumbria fluctuated: a small area around Bambrough in the mid 6th century; then a very considerable tract of land by the mid 8th century, as far as Dumbarton and the Clyde [Musgrove p.45]. After the Viking incursions of the 9th century, the situation changes again, and the abandonment of Lindisfarne in 880 AD might be taken as a symbol of the decline of Greater Northumbria. The Viking Kingdom of York became a more significant focus in the mid 9th to mid 10th centuries; thereafter, we are left with the shire known as Northumberland and the Norman Palatinate of Durham, the latter drawing its cohesion from the central role of the relics of St Cuthbert at Durham. The Golden Age of Northumbria thus spans a scant two centuries, and its reputation, at least as far as size and durability go, includes a dash of modern wishful thinking. Northumbrian culture was firmly based on the Roman Church; but it was coloured with a consciousness of Irish influence; and seems aimed to establish an identity that was not Deiran or Mercian or southern English. The defensiveness inherent in this position is revealed in a letter Bede wrote late in his life in 734 to his former pupil Ecgberht, who was about to become the first effective Archbishop of York. He writes to define the delicate issue of the relative roles of secular power, episcopal church and monasteries; and his concern – as in the ‘official’ Life of Cuthbert he composed – is surely the integrity and interests of the Northumbrian (scit/alias Bernician) Church. The culture of Northumbria is famous in terms of sculpture and building, illuminated manuscripts, Latin composition, and the pioneering of writing in OE. However it does not depend on ‘dialect’ in any meaningful sense. Though it is usual to talk of the OE ‘dialects’, and though Old Northumbrian, and Anglian as a whole, had some differences of vocabulary and grammar distinguishing it from southern OE (‘West Saxon’), it can be misleading to overemphasise these, or imagine they are directly comparable with dialect as it later emerges in the break-up of English after the Norman Conquest. Southern poets, like the versifier of the OE Metres of Boethius, had no difficulty in affecting the ‘long verbs’ typical of Anglian poetry, and his audience had no problem in accepting them; in turn northern poets (or a northern audience) had no difficulty in coping with the Late West Saxon that typifies the poem ‘Durham’ of about 1100. That much of OE poetry survives in a form we identify as ‘Anglian’, written down in West Saxon manuscripts, does suggest that the achievements of Northumbria were well regarded in succeding centuries; and it is notable that West Saxon kings like Athelstan took care to associate themselves with the tradition of St Cuthbert. heben til hrôfe, hâleġ Scepen. the-heavens as a roof, holy Creator. These historical points need to be dealt with – in preface – are there are those who see the modern dialect of Northumberland as a direct descendant of the Old Northumbrian of the AS age. Matters are far from being that simple. After the Norman Conquest – and arguably before – northern English began to diverge significantly from southern English in points of vocabulary (due to the Viking settlement), in pronunciation of stressed long vowels and the consonant pairs ch/k, sh/sk, y/g (technically, in rejecting palatisation), and ultimately in the simplification of suffixes, and thus word-inflexion and grammar in general. The greater pressures for language change were undoubtedly felt in the north; by the 15th century a simplified system of grammar was transferring from the north to the south, to combine with and significantly modify ‘Chaucerian’ English; while the resulting compromise form of English forged especially in London was re-exported to the north during the 16th century, to become a scribal and perhaps spoken norm, at least in the sector of the population aspiring to education and influence. It would be strange if the the point of highest divergence in spoken English – say from the 12th to 14th centuries – did not have implications for political coherence and regional identity. Loyalties in the North East would surely revolve around great aristocratic families like the Percys – whose leaders would be as familiar with French as English. Thus the celebration of Edward I’s victory at the Siege of Carlaverock in 1300 was composed in Ango-Norman rhyming verse; it includes a place for the Bishop of Durham, and its virtual catalogue of coats of arms and military status shows how little the ruling class were concerned with the promulgation of identity at a popular level. The 14th century saw not only the growing political and cultural acceptance of English in its various forms, but the emergence of a division in English poetry between an alliterative structure (e.g. ‘Gawain & the Green Knight’ in the north-west Midlands) and a rhyming one (e.g. the ‘Canterbury Tales’ in London) – it is surely of significance that Chaucer drew his patronage from the Crown, while the anonymous Gawain poet was likely associated with a provincial source of patronage. If a lesson was drawn from the War of the Roses it was the perceived need for a strong central government – and by about the mid 15th century this administrative need identified itself with the ‘new’ English developing in London. The medieval Babel that was English was far from settled however. The Lollards published their work in a more traditional southern English, presumably as the most popular medium available in the south of the 14th and 15th centuries. This southern standard was also retained by the less radical party of the Anglican Church, who continued not only gothic architecture and black letter titling into the 17th century, but retained the older form of verbs like giveth and doth for the King James Bible of 1611. In the North East, in the 15th century, there is a long rhyming English poem on the Life of St Cuthbert, the central icon of the North East upto the Reformation. At the same time, Border Ballads were starting to be composed – in rhyming quatrains appropriate to song. Was the acceptance of rhyme in the North made easier by a tradition of rhyming verse in the Viking cultures? – there is a marked similarity between Northern English ballads and the metre of Danish ballads dating arguably to much the same time. Though the rise of a new or Metropolitan English, synonymous with the rise of London as capital city, is the dominant feature in the history of English from the 15th century on, the 16th century saw a series of developments that further complicated the picture. Firstly, a range of words based on Latin and Greek began to be introduced into English, surely a consequence of the intellectual prowess of post-Reformation scholars in the first instance. Secondly, there was The Great Vowel Shift. This not only moved vowels ‘forward’ (this refers to the position of the tongue in the mouth), but led in turn to the formation of new diphthongs from the resulting fronted long vowels esp. the /i/ (in hive) and the /a/ (in save). The origins of this move are obscure: could it have stemmed from a need to differentiate new London English from its Northern roots? Certainly this feature of English was not fully accepted in the further North until the 20th century. Historically, the resistance to the Reformation in the North East might be expected to favour traditionalism in spoken English. A relevant text in this period is the ‘Rookhope Ride’ – a ballad asserting the role of the Bishop of Durham’s officers in defending Weardale, when many of its chief figures would be in jail following the 1569 Northern Rebellion of the Earls. This is perhaps the first example of the use of dialect to influence local loyalties on a tactfully secular basis. From the 15th or 16th century comes a fragment of a miracle play from Newcastle (on Noah’s Flood), which attests to the growing importance of that city and its concern with public demonstration of its status. In the face of lack of records of speech of the time, we can only conjecture that ideological conservatism may have taken the form of resistance to London English, and assisted the conservation of many dialect features. Nonetheless, the NE dialect of the ‘Modern’ period, say from the 17th century onward, is not strictly isolated: rather a curious hybrid of local Middle English and some aspects of Metropolitan English, for though its differences justify the term of ‘dialect’, the language heritage from Anglo-Saxon times has been through more than one complex transformation by the time we reach printed records. The North East could not not be aware of the impact of printing and education, and Guild records in Newcastle in the late 16th century are in a modern English mode, with occasional regionalisms of vocabulary. The first North Eastern printed pamphlets – propaganda issued in the Civil War itself – were strictly Metropolitan English. In 1673, (in Moorman’s words) “the York printer, Stephen Bulkby, had issued, as a humble broadside without author's name, a poem which bore the following title: A Yorkshire Dialogue in Yorkshire Dialect; Between an Awd Wife, a Lass, and a Butcher.” This was followed in 1683 by a booklet A Yorkshire dialogue by George Meriton (1634-1711), a lawyer and antiquary of Northallerton; and his follow-up The Praise of Yorkshire Ale (1697). These are non-politcal, even dully commonplace in their material. George Meriton was also author of a history of England, which, while it condemns the execution of Charles I, gives a detailed and objective account of the Civil War. Exemplary as this neutrality may be, it makes it rather hard to place this initiative in the frame of later 17th century Yorkshire, a region that was the home of General Fairfax and where Andrew Marvell was M.P. for Hull, but which saw risings both in favour of James II and William-and-Mary in 1688. There may be an element of separatism in all this, but more relevant to a county beginning to use its history and language as considerations towards identity than one with ready-made historical allegiances and self-image. One clue leads on us: Meriton provides a link with the more intellectual efforts of The Royal Society in the matter of dialect: for he included a clavis or glossary with his work, showing he was associating his efforts with a broader audience, and intended to be part of a more intellectual movement. John Wilkins (1614-1672) was Bishop of Chester and a founder member of The Royal Society. His masterpiece, An Essay Towards a Real Character and a Philosophical Language was published in 1668, and argued for the creation of a universal language. In this he may seem to taking a stance against language devolution, but he was important in setting the theoretical grounds for studying language, and was associated closely with John Ray and Edward Lhwyd, the Celtic linguist. John Ray (1628-1705), better known perhaps as a pioneer of botany and plant classification, was also the first author of a major dialect study, the Collection of English Words, Not Generally Used (London, 1674), which lends dialect for the first time an acknowledged academic status. White Kennet (1660-1728) was Dean and afterwards Bishop of Peteborough; his manuscript ‘Etymological Dictionary’ goes further than Ray, in that his national collection of dialect words was provided with notes on word origins in Old English or the Norse languages, and – important for the study of dialect – each entry was accorded a note on the counties in which the word was used. It is supposed he benefitted from having the great scholar of languages, George Hickes, as a lodger in the 1690s. These were the sort of people who were giving dialect a new status and a dual future – as living language and academic discipline. They can be helpfully viewed as scientists – men who were concerned with the evidence of language around them, much as they would be with natural history. Presumably it was in this sense that dialect was seen as one of the legitimate focuses of The Royal Society. While doubtless Charles II is due much credit for his patronage of the Royal Society, the politics of the above-mentioned dialect enthusiasts is worth considering. John Wilkins married Cromwell’s sister in 1656. He was the acknowledge leader of the ‘Invisible College’ of the 1650s [1653+] that drew together the nucleus members of the future Royal Society. John Ray lost his position at Cambridge in consequence of refusing to comply with the 1662 requirement to swear an oath codemning the Commonwealth period Covenant. Thomas Sprat wrote an encomium of Cromwell in 1659, though subsequently he was more avowedly Stuart in his allegiance. However, he signed a Petition for a Free Parliament in 1688 along with Sprat, White Kennet and others. White Kennet was pictorially represented as Judas in the 1700s for defending the Hannoverian succession. None, perhaps, should be viewed as radicals. But it is worth considering that some of the appeal of dialect at this time may have been as a sort of counterpoise to an over-centralised and arbitrary government. If so, it pointed the way forward to the role of dialect in the next century and more. It is with the growth of industry and an industrial population in the North that dialect can first be examined as a symbol of the aspirations to regional identity; especially in urban contexts, under-represented in Parliament, and not without an awareness of Scottish radicalism and dialect initiative in the later 18th century. The growth of large-scale industry took the workers away from a situation of agricultural almost feudal dependence and largely traditionalist impact, where (to quote Edward Chicken). to a situation where numbers and exposure to ideas renders this proletariat a real force – politically, economically, and linguistically. Much of the 19th century, one might argue, is spent in controlling and placating, housing, educating, and garisonning this phenomenon. In this case, it seems that the immigration is from rural Northumberland. We need to remind ourselves that Benwell and indeed many other pits on the banks of the Tyne for some 8 miles west of Newcastle were set up in the 17th century; and not only the Tyne but in many locations from which it was relatively easy to transport the coal by water: e.g. along the Wear and on the Northumberland coast. The Pennines and the Upper Wear valley, with their lead mining, may have fewer spare workmen to contribute to projects on the Tyne; this early stage of Tyneside dialect we may reasonable, with Edward Chicken, attribute to Northumberland influence. The link between miners and dialect is reinforced by Thomas (not Joe) Wilson’s long 3-part poem, The Pitman’s Pay, published in the Newcastle Magazine in the 1820s. Part One is in standard English with direct speech in dialect; Parts Two and Three are entirely in dialect, and paint a grim picture of mining conditions at the turn of the century; for the dual purpose of encouraging reform of working conditions, and promulgating temperance among the workers. This may also be said to be written in ‘early’ Tyneside dialect, though rather difficult to follow because of the high proportion of ‘slang’, that is words of temporary currency. Fortunately the 1872 edition included a glossary. Another poem I believe to be by Thomas Wilson is a satire upon the indecision for a new route for the main road through Gateshead to Newcastle, published in the Tyne Mercury, 1824,m and republished with notes as a booklet in Newcastle in 1825. The diversity of routes being put forward, generally according to local property bias, are typified in the notes of 1825 as “A most lamentable proof of the ‘wanderings of the human intellect,’ and is one more instance of the absurdities men run into when they chose [sic] to abandon reason and common sense.” While a later footnotes comments on: “A noted place for gamblers some forty years ago. The pit lads were then in the habit of meeting here every Sunday morning, when the weather was fine, and spending the day in shake-cap, marbles, trippet and coit, and other games. But this has happily been discontinued for many years. We are indebted for this reform in our morals to the Methodists and Sunday Schools.” This reforming voice in dialect work is confirmed by the many songs advocating teetotalism by the later Joe Wilson. In World War I, this is still apparent in a book Jake and Me, arguing against drink and gambling, and based on the experiences of Durham miners in the 1910s. Geordie, of course, is a familiar form of George; and this is a timely reminder that in the north it has connotations of Hanoverianism. The collection is a strange mix of would-be gentility and common prejudice. Whoever their authors were, and only a few are attributed, the songs testify to a wide interest in dialect among a range of educated and non-educated people; a popular movement that had clearly overtaken the intellectual glimpses of dialect allowed us in the 17th and 18th centuries. Alongside such work, and broadside publication, we should mention the more scholastic or antiquarian collections or ‘garlands’ of Joseph Ritson; while songs collected by John Bell were published as Rhymes of Northern bards (1812); many more that were sent to Bell have survived in MS, commendably edited by Dave Harker. The MS (at Newcastle University) is a compilation of diverse sheets, mostly letters, through which medium local songs had been communicated to Bell. This context is not really brought out in Harker’s edition, the text of which only gives the extracted songs; but even a quick scan of the MS suggests that this was a rather gentlemanly correspondence, as likely to be concerned with coats of arms and genealogy as with popular culture. Yet, though the writing down and publication of such texts remained a somewhat elite occupation, there is no doubt of a substantially popular (of you prefer, common) input. To what extent were these compositions generated by the dialect users, or for the dialect users? That is, do they represent a natural identity or an attempt to forge or control such an identity? We can make apt comparison with the collection Des Knaben Wunderhorn made in Germany by von Arnim and Brentano between 1806 and 1808: there too an attempt was made to represent the voice of the people, but the best descriptive term for such verses might be ‘popular’ rather than ‘folkic’. The situation is as paradoxical as a set of parallel mirrors: there is anonmyous composition; it is taken up by those with sufficient awareness to appreciate the merits and potential of the work, and sufficient resources to pay for the printing; this in turn attracts the attention of a yet wider audience; there is more popular composition and more learned interest; until it is hard to tell who is influencing whom. In the 1810s, for example, we find the Milbanke family of Seaham adopting the cobbler-poet John Blackett; for them the educability and achievement of the Common Man seemed to be the question, rather than class consciousness or identity. In seeking clues to regional identity, we need to be aware of the diverse groups making up the Tyneside population in the early 19th century, and which must have telled against any easy sense of a common cause, whatever the linguistic cohesion. Sailors, keelmen, miners, workers in other industrial concerns – iron, chemicals etc. – all (we may assume) non-voters – probably felt a loyalty to their fellow workers, to their employment, to their employers, to their family and immediate neighbourhood, to their personal promotion and so on. Loyalty by national origin – especially among Scottish and Irish workers – would have been a further unifying but also divisive factor. Among the currents of political radicalism and monarchism typical of the early 1800s, I am not aware of any attempt to use dialect to mobilise the workers to mass political ends. Newcastle was a centre of finance, employment and entertainment, but no dialect verse celebrates the building of Grainger Town or the erection of the Grey monument. PART THREE - OF KEELMEN, ETC. To return to the issue of the growing population and culture of Tyneside. Despite the work of Chicken and Thomas Wilson, it would not be fair to give the impression that North East dialect is somehow the preserve of the mining industry, or that ‘Geordie’ is necessarily a miner. There was in Newcastle a large body of keelmen: by 1700 an estimated 1,600 men, with a fleet of 400 keels (The Maister p.35) These were likely to settle on the Quayside area, and their occupancy of Sandgate is reflected in the well-known dialect song ‘The Keel Row’. There is good evidence for a Scottish contingent in this workforce: an article by W. Stanley Mitcalfe [‘The history of the keelmen and their strike in 1822’ AA 4th ser, vol.14, 1937, 1-16] includes the information: “In the 17th and 18th centuries a considerable number of the keelmen were of Scottish origin, and many of these men were accustomed to return to Scotland in the winer. Lists of keelmen at the town hall dated 1729 show a surprising number of keelmen originating from near Edinburgh, and in some lists as many as fifty per cent.” (p.2). This raises some very interesting speculations, not only about the sources of 19th century Tyneside dialect, but about the origin of the word ‘Geordie’ itself. It may well be that certain peculiarities of Tyneside speech come from this Scottish connection: divvent is reported in use in Scots speech by the 19th century – but is not used by Thomas Wilson; in Brockett only ‘div’ is mentioned briefly as “very common among the vulgar” for ‘do’; he also lists dinna and disna (no location). A list of Alnwick words about 1879 mentions ‘div’ and ‘dinna’ but not ‘divvent’; it is unlikely to have been brought to Newcastle by Northumberlanders however, as it is lacking in the early stage of ‘Geordie’ which was apparently moulded by people from Northumberland. A second word ‘hoy’ is another useful indicator. I have not yet located it in print in the North East before 1827 – and it plausibly also has a Scots origin, though ‘hoy’ is noted there in the 17th century in the sense of ‘expel, drive out with shouting’. Allow that a word may have more than one mother, and we might imagine it merged in the North East with forms of ‘hoist’, plausibly from Dutch, gaining the sense ‘to throw’ or ‘to lob’? ‘Hoy’ is not found in the mid 19th century list of Alnwick words; like the Scots themselves it seems to have jumped over the intervening county. It is also omitted by the 1849 Teesdale Glossary. In Co.Durham, the paucity of Sharp’s 1834 Bishoprick Garland leaves us with no great sense of dialect initiative there, though lack-lustre editing may have obscured much. On the political side there is an election tract of 1800 from Durham City which includes a pastiche of Burns’ “A man’s a man for a’ that”; Harker’s recent (1999) editing of songs and texts of the miners’ strike of 1844 is ample proof of political awareness among miners – but few of these songs shows any dialect content. Satire and comment in dialect are an occasional feature of the Tyne Mercury and the Newcastle Magazine of the 1820s, but with an eye to self-improvement rather than political gain. It may indeed be that some of those songs we take as uncomplimentary about Geordie or his lass, are a sort of double-bluff – like the comic character Bob Cranky or the set piece of the clever PD and the stupid skipper. The impression is, that in the North East, dialect was not often considered appropriate for serious tasks: it remained the medium of travelling fairs, musichall and amusing publication for much of the 19th century while Trade Union minutes would be written in proper English, no doubt. But then what is published is what will sell, notably what amuses, and there is many a journal and tract still to check. Provisionally, it appears that dialect was more an attribute of the working class than a means of manipulating them, or providing them with identity. Arguably, it could be used to assert identity, but this perhaps awaited higher levels of awareness of the new century. An example of classic dialect writing from the 1890s is Alexander Barrass’s Pitman’s Social Neet. Barrass himself worked as a pit sinker in several collieries in Co.Durham though he was increasingly drawn to writing in both Standard English and dialect verse. The central song of the Pitman’s Social Neet is a quasi-anthem of the North East, and appropriate to a mining age, looks to St Nicholas’ church in Newcastle rather than Durham Cathedral as its focus. The devotion expressed is personal, even sentimental, with only occasional reference to a wider social or historical sense of place. The high rates of immigration into the area up to World War, and the mobility of the mining population in a fast developing industrial era cut across county boundaries and hindered potential loyalties based on national origin or religion. Nonetheless it is in the late 19th century and early 20th century that we think of concepts like Regionalism and this era seems indeed the high point of dialect awareness. The establishment of County Councils in the 1888 Local Government Act resulted not only in the Victoria County Histories but gave practical meaning and force to the term ‘county’; a similar awakening of area identity is evident in the Rev Atkinson’s Cleveland Dialect Dictionary of 1868, and Oliver Heslop’s large dictionary based on Newcastle, originally published in the Newcastle Chronicle in the 1880s. Dialect, as the remnant of Middle English as the remnant of Old English increasingly attracted scholastic interest – at least in its rural form. The dialect movement of the late 19th century resulted in the great English Dialect Dictionary of 1898-1905 [Joseph Wright] and is a monument indeed to the intellectual appreciation of the value of local speech - but as recently as the Leeds University Survey of the 1950s, attention remained concentrated on agricultural speech at the expense of industrial speech. World War I and its county-based organisation of troops would have sharpened this sense of region and contrast with other regions – are non-commissioned officers the interpreters between officers and men? In the most everday sense, the issues of dialect unity and contrast would have been apparent to the troops. But in the aftermath, one thinks more of the turning-in of the community in upon itself in the hardships of the 1920s, and it is likely the minor variants in dialect between pit villages stem from this time, the settlements in Co.Durham being rather isolated and dispersed. For the emergece of a broader regional picture we think more of the sense of mass identity fostered in the 1930s – through popular newspapers, stereotype films, organised national political parties and increasing state intervention in matters of housing, schooling and employment – also (coincidently or not) the time a concept of the North East as such became established. But there is relatively little dialect publication in this period – the anthems of the North East – the Blaydon Races, Cushie Butterfield etc., were the products of the previous century. Perhaps they were all the more effective for that reason – but the record of dialect creativity is not impressive. A more settled population and the relatively stable industrial traditions of mining and shipbuilding would doubtless aid local loyalty while not acting against a sense of regional identity, but dialect seems to be the proof rather than the cause of this. ‘Pitmatic’ was first noted by J.B.Priestley in the early 1930s (published 1934 in English Journey). It may indeed not be until the 1960s that a link was made between dialect and place in a simplistic, significant way. I refer to the ‘Geordie revival’ of Scot Dobson and others, when the confidence and effectiveness of Labour voters was reflected culturally in cities like Liverpool and Newcastle. Though I had the pleasure of visiting Newcastle from the mid 1960s on, I am not an expert on this time: Connie Pickard and Bill Lancaster assure me the initiative came from art schools, jazz clubs; in short, the younger self-educating class. Scot Dobson’s humorous pamphlets are the first example I am aware of, of what might be called aggressive dialect: the culture of the Geordie is affirmed, defined and celebrated; part of a search for identity, it may be, as much as a purely traditional sense of belonging. A ‘Geordie revival’ or a ‘re-inventing’ of identity? Newcastle was at a disadvantage here in not quite capturing the love-lorn adolescent yearning of the Liverpool sound. We may seem to have come a full circle, out of history and back into history. But there is a real sense in which dialect subtends the community at an unstated level – language is after all one of the basic defining factors of the human condition – and though there has been relatively little conscious exploitation of the dialect (as far as I can detect), the development of the dialect itself contains some indications. In the first stage of Tyneside industrial speech – say from about 1700 to about 1820 – there is little to distinguish it from the dialect of the North East as a whole, or indeed a wider Northern English. Geordie proper seems to date from about 1820 and may owe a particular character to input from Scottish elements; in the course of the 19th century, much of its special vocabulary seems to have become common to the North East coalfield, such was the extent and status of the coal industry - so that in a sense dialect becomes the marker of mining community which in turn is all but synonymous with the term North East. Whether, when it comes to a vote, this regional identity will win over the more traditional county or local allegiances is an issue that many are doubtless mulling over at just this time. It is not easy to bring out this unacknowledged community role of language, which only occasionally reveals itself in printed form; and it would be unjustified to generalise about the attributes of such a community. One aspect I would like to touch on in conclusion is the role of humour as a regional identifier – at a level that has little to do with politics or boundaries, or with the commercialised traditions of professional minstrels and music hall, or similar dialect images - but the everyday humour, sometimes quite dark in tone, continually inventive and essential to that ‘sociability’ we hear of, and that lends assistance in bleak enough circumstances. It is evident in word-play – bumbler-box (originally a small box for a child to capture a bee in) turns up in a post-War dialect list, meaning a small modern house. Or the adult-to-adult jibe about managing ‘joinedy-up-writing’, or even ‘joinedy-up thinkin’; the colourful phrases that even the elegant John Trotter Brockett cannot help passing on: when he illustrates the word ‘dowp’ meaning buttocks by the phrase “As fine as F**ty-Poke's wife, who dressed her doup with primroses” - the put-down for any housewife affecting airs and graces. Scott Dobson is outstanding in capturing the humorous commonplaces of the 1960s and 70s: his may seem to be an unreformed picture, dwelling unduly on beer-swilling, casual violence and marital tedium; but the scope of his subject matter is quite remarkable, ranging from facetious definitions to invented history to Geordie vampires. To finish with, then, some of his more restrained, traditional images, from Stotty Cake Raa in Clartybank Colliery, which he tells us is somewhere between Blyth and Morpeth [p7, 1971]. "Noo, yor a fair doon reet feul, not an artificial feul like Billy Purvis! Thous a real Geordie! Gan man an hide thysel! Gan an' get thy picks agyen! Thou may de for the city, but never for the west end o' wor toon." Purvis himself was born near Edinburgh in 1784, so it is unlikely ‘Geordie’ here, as a term of abuse, means Scotsman, though Frank Graham, quoting the passage in his Geordie Dictionary, takes the word to mean ‘fool’. It is unlikely to mean someone who lives in central Newcastle as opposed to the West End: miners were likely to inhabit the West End rather than Grainger Town. the reference to ‘city’ probably means: you may fool the city folk but not honest down-to-earth folk like us. By a process of elimination, ‘Geordie’ here seems to mean miner, but not as a term of endearment, or one to be proud of. ACKNOWLEDGEMENT - The above lecture notes are entirely the work of the late Bill Griffiths. A wonderful man who did so much to promote appreciation of our Northumbrian dialect. Back to Home Page for info on our dialect songwriters/CDs/local history etc.